Great deal great staff. Love the hotel. Finish the renos already!! Nicely renovated rooms. Very clean and priced well. Rooms were very dark and no fan in bathroom, sound echoed. Staff was helpful and breakfast was a plus. The perfect hotel for a downtown visit. Newer and situated on the main downtown street for shopping, diner and drinks. The pool and fitness center is a favorite of mine due the high level views. staff were very friendly and helpful. Room was clean and roomy. The room had a balcony, you could go out and catch a breath of fresh air. Good restaurant and bar.Breakfast was good but pricey. We also enjoyed the location as it was close to everything including Prince's Island! Good size suite with balcony, clean and comfortable, good breakfast, 24-hr pool, bus stop of #300 to airport about 100m from the hotel, short walk to Prince Island Park. Near the Eau Claire Market, Prince's Island Park, playground for the kids, live theatre in the park, restaurant nearby on the river and others. Close to uptown & Prince's Island Park. Prince's Island Park is located in a vibrant area of Calgary known for its beautiful river views and popular theater scene. The neighborhood is home to 46 hotels and other accommodations, so you can find something that works for your stay. The Fairmont Palliser: With a stay at this 4-star hotel, guests can enjoy access to a full-service spa and a restaurant, along with WiFi. It's a favorite with Expedia travelers for its proximity to shopping and comfortable rooms. Sheraton Suites Calgary Eau Claire: With a stay at this 4-star hotel, guests can enjoy access to a restaurant and an indoor pool, along with a private living room. It's a favorite with Expedia travelers for its central location and helpful staff. 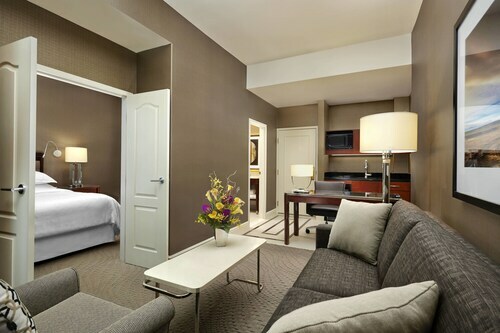 International Hotel and Spa Calgary: This 3.5-star hotel features free breakfast, a restaurant, and an indoor pool. It's a favorite with Expedia travelers for its family-friendly amenities and bar. Now that you've visited Prince's Island Park, you can explore the sights and attractions within a few miles of the area. Study the collections at The New Gallery, Art Gallery of Calgary, or Glenbow Museum. Calgary Tower, Calgary Chinese Cultural Centre, and Peace Bridge are notable landmarks to explore if you're in the area. You can check out the local talent at GRAND, Plaza Theatre, and Calgary Philharmonic Orchestra. Scotiabank Saddledome, Stampede Park, and Calgary Zoo are a few additional nearby sights. Spend some time checking out University of Calgary, which is 3.1 mi (5 km) from Prince's Island Park, or make a stop by Canada Olympic Park, located 6.7 mi (10.7 km) away. Take advantage of metro transit at 3rd Street SW Station, 4th Street SW Station, and 6th Street SW Station. If you'd like to venture around the surrounding area, consider renting a car to take in more sights.